Official synopsis: "Our hero? Jack Samsonite His mission? 1) pass his GCSEs 2) get the girl (to notice he exists) 3) survive the week without a serious face punching Good thing he's got a plan. 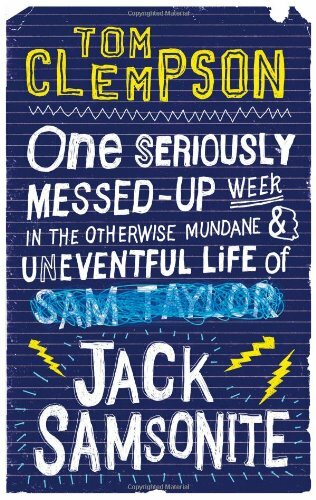 Well, half a plan..."
Well the award for the longest title of the year goes to... One Seriously Messed Up Week In The Otherwise Mundane & Uneventful Life of Jack Sampsonite! A whopping 15 words and 90 characters! Brilliance already! It's not an overly long title in the sense that it's crap... just that it's brilliant! It certainly captured me when I first saw it online a few weeks before publication. The lovely Mr. Clempson himself and I have spoken a few times on Twitter and I was very excited to read this so when my copy arrived from Amazon I couldn't wait. And it's timing could not of been better. I came home on a Friday night after a particularly stressful day (and week at that) at work in need of something light and fun to read, and word on the grapevine was that this book was very good, light and funny. And you know what? It was! Just the thing the doctor ordered! Right from the first page, the first word even (and you'll see what I mean by that when/if (no not if... you must read it!) you read it!) I was laughing. In fact that first page had me in fits of laughter. This book really really pulled at my inner, immature self. Now, as most of you know and as my bio says to the right, I'm only 19, so I'm still pretty immature, and I love it, so this was a delight to read. The words used in this piece of brilliance were those I used at that age (even though it was only 3 years ago). It really reminded me of being at school. There were points when I was laughing, nearly crying, thinking "Oh god... that's me!!". Ha. It really was a great read and made me reminisce about my own school days. 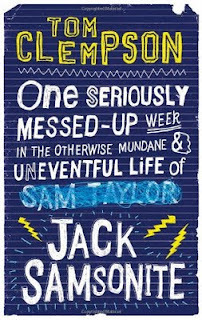 The character of Jack - or Sam whichever way you want to look at it... - pulled at my heartstrings a bit. For the most part I knew exactly how he felt. I was pretty much the kid he was at school. I had my close ring of friends, and whilst I wasn't everyones enemy, I wasn't exactly that popular. I was just never that sort of person. And I sure as hell had my fair share of embarrassing moments at school - but that's not for here! I cannot commend Tom enough right now, in all honestly. He is something of a God to me after reading this book. He evoked so much in me with such a fun read that I cannot begin to explain just what he has done to me! My thanks to you Tom, for hours of fun reading, and an aching stomach from too much laughing - oh and for relieving some stress! Top man! I really cannot recommend this book enough. To all boys. Even girls. To the old. And the young. Just do it. Now. Don't hesitate! Just get on Amazon now, and press that buy button! Cover Art News: Torn by Cat Clark!!! ZOMG! Giveaway: Signed Copy of Swim The Fly!